Skull, Black Magic Mystic Potions, Painted Pony, Alice in Wonderland. Circling round and round above the sunlit valley, the majestic eagle watches over its wilderness domain. Impressive wings spread wide, the eagle glides across the sky and is the unsurpassed master of its lofty world. And nothing is more inspiring. Now, you can experience a thrilling new perspective of the eagle in flight with the Soaring Majesty Levitating Sculpture, a first-of-its-kind levitating globe sculpture featuring Ted Blaylock eagle art, available from The Bradford Exchange. Capturing 360-degrees of beauty, this sphere actually hovers and spins in mid-air, a levitating wonder made possible by hidden electro magnets inside the globe, suspending it above the custom base. Acclaimed artist Ted Blaylock's vivid imagery of eagles in flight is superbly crafted on the entire surface of the globe, where the artist's command of realistic details and natural hues bring the majestic eagle and its beautiful world to life. Plus, at the flip of a switch, built-in-lighting around the base glows upward onto the globe - and enhances even more of Mr. Blaylock's exceptional imagery, adorning the base in four golden-rimmed visions. It's an inspiring work of art from every angle! Strong demand is expected, so don't delay. Order now! "The horse is such a noble masterpiece of physical and spiritual beauty," states acclaimed artist Laurie Prindle. And nowhere is it more beautifully represented than in The Spirit of the Painted Pony Sculpture Collection - the artist's sculptural debut - exclusively from The Bradford Exchange, Hawthorne Village Division. 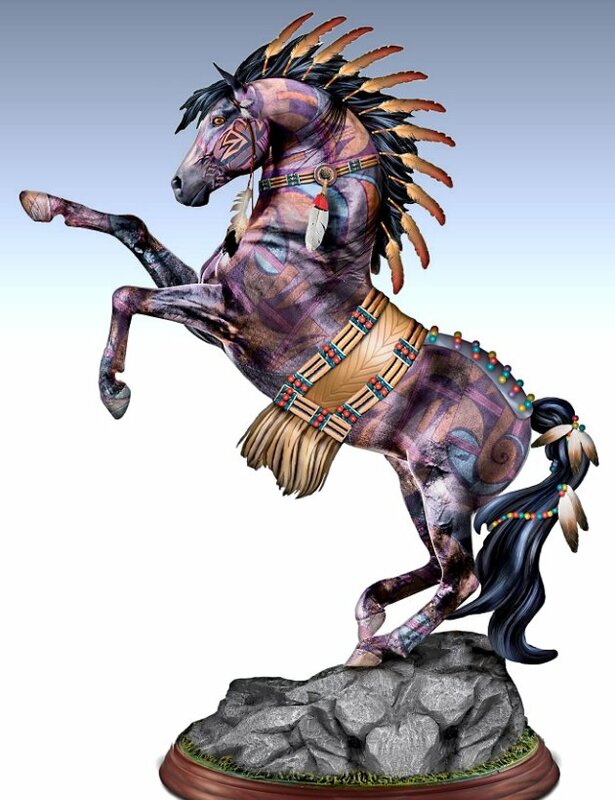 This collectibles market premiere features magnificent, Native American-inspired painted ponies, each inspired by the acclaimed original art of Laurie Prindle. Your collection begins with Issue One, Shaman. Soon your collection will continue with Issue Two, Spirit Warrior and additional Native American-inspired horse sculptures, each a separate issue to follow. Black as midnight and just as mysterious, this sleek feline slips out from the enchantress' shadow to offer you a little magical elixir all her own - the purr-fect cure for unrequited love. For with just one sip, that elusive "someone special" you've been admiring will suddenly discover that you're the cat's meow! Now you can fall under the spell of this "cat-tivating" feline by artist Blake Jensen with The Cat's Meow Figurine, exclusively from The Hamilton Collection.The graceful form of this limited-edition cat figurine temptingly entwines around her coveted treasure with an alluring cat-eye gaze as she invites you to come closer. Her striking amethyst-colored collar shimmers with a perfectly matched faux gem. A special high-gloss "coat" is hand-applied for a truly regal shine. The precious vial of "potion" has a luminous glow of purple with etched patterns on the vial's hand-painted metallic accents. Its full-color label is meticulously hand-applied for a bewitching finishing touch! Strong demand is expected for this handcrafted cat figurine inspired by Blake Jensen art, so don't delay. Order now! Cats hold our hearts within their paws and captivate us with their marvelous eyes. Now you can fall in love with the allure of cats as portrayed by master artist Blake Jensen in the Black Magic Mystic Potions Figurine Collection, a limited edition exclusively from The Hamilton Collection. Your collection begins with Issue One, The Cat's Meow. Soon your collection will continue with Issue Two, Purr-fectly Lucky, Issue Three, Cats Eye Time Tonic and additional cat figurines, each a separate issue, will follow. These stunning cat figurines feature hand-applied sparkling faux gems and a high-gloss top coat for an extra dimension. Each figurine is hand-painted with alluring, deep colors to bring out the essence of charm that belongs only to a cat - and each poses with a luminous potion bottle offering wishes for good fortune, wisdom, longevity and more. From their pointed cat ears to the tips of their cleverly flicked tails, no detail has been left to chance. Strong demand is expected for this collection of cat figurines inspired by Blake Jensen art, so don't delay. Order now! With a style all her own, the lovely Tinker Bell has been spreading never-ending possibilities that dreams do come true to those who believe in magic. Now, you can express your love of the imagination with this sparkling Tinker Bell charm bracelet, a fine jewelry design from The Bradford Exchange. Licensed by Disney, this stylish bracelet features 14 handcrafted interchangeable Tinker Bell charms gleaming with rich, 18K gold plating, shimmering sterling silver plating, dazzling crystals and colorful enamel. Exquisite charms include Tinker Bell in three different signature poses, a heart charm with the quote "Faith, Trust and Pixie Dust", and four beads with inspiring words. Plus, this charming Disney Tinker Bell keepsake arrives in a velvet jeweler's pouch and presentation case, perfect for safekeeping and gift giving. High demand is expected. Order now!This fine jewelry is intended for adults. Take a moonlit passage into the heart of the wild with this dramatic collectible wolf art sculpture! The shining mystery of acclaimed artist Al Agnew's wolf vistas comes to life, showcased on clear acrylic panels that rise majestically upward to form a sleek, beveled tower. Flip a switch and watch as shimmering light sets Mr. Agnew's wondrous imagery aglow. Deeply beveled bases support and crown the tower, topped by a handcrafted lifelike sculpture of howling wolves. The icy ledge upon which they stand shimmers with light from below. Now, just imagine the drama and mystery this sleek, impressively sized work of art and sculpture will bring into your home - but don't wait! Strong demand is expected for this powerful Bradford Exchange exclusive limited edition, so order now! On December 9, 1965, the holiday season was changed forever! 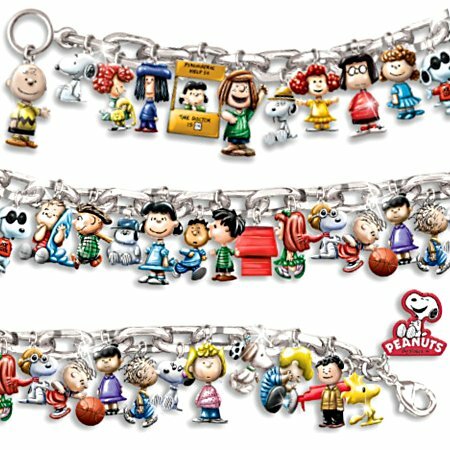 With the television premiere of "A Charlie Brown Christmas", Charles Schulz's unique vision became an instant holiday classic. Now, A Charlie Brown Christmas 50th Anniversary Masterpiece Edition Collector Plate commemorates a half-century of the joyous wonder that was so masterfully captured in this beloved holiday TV tradition. Only from The Bradford Exchange, this definitive PEANUTS Christmas collector plate is offered in a strict limited edition of 5,000 worldwide, and beautifully showcases full-color scenes of your favorite schoolyard kids, their precocious dog Snoopy, and the scrawny tree that stole our hearts 50 years ago. Impressively sized at a full 1 foot in diameter, this A Charlie Brown Christmas Collector Plate is expertly crafted of lustrous Heirloom PorcelainÂ®. The red inner border features swirls and snowflakes in 22K gold, complementing the 22K gold outer filigree border and Charles Schulz's 22K gold replica signature. Destined to become an heirloom loved as much as the holiday special, your A Charlie Brown Christmas 50th Anniversary Master Edition Collector Plate arrives with a Deluxe Presentation Case, complete with a foil-stamped A Charlie Brown Christmas logo and silken lining, for the ultimate in storage and protection after each holiday season. Strong demand is expected, and first reservations will receive the coveted lowest edition numbers. So hurry - order now! Timber wolves have long been heralded as majestic guardians of the woodlands and tundra. The noble beasts are woven into Native-American legend for their spirit, grace and power. Now you can enjoy a stunning glimpse of that majestic spirit with the Mystic Spirit Wall Decor, featuring wolf imagery by acclaimed artist Al Agnew and available in a limited edition exclusively from The Bradford Exchange. This unique wall decor showcases Al Agnew's imagery of a pack of majestic wolves exploring the forest on a calm wintery day, hand-applied onto a sparkling clear crystalline arrowhead. The edges of the arrowhead have been handcrafted for a multi-faceted look that catches the light while built-in LED lights illuminate the wolf artwork from within. This illuminated wall decor is further embellished with genuine feathers, hand-strung beads on real leather and a silvery medallion accented with hand-painted turquoise hues. Strong demand is expected, so don't delay. Order now! SAIL HO! Set sail through the high seas on the legendary Black Pearl! Now, capture the fantasy of the Disney Pirates of the Caribbean films and their timeless characters and swashbuckling adventures. Introducing the Disney Pirates of the Caribbean Glitter Globe, a musical globe licensed from Disney and offered in a limited edition of 295 casting days from The Bradford Exchange. This Disney collectible captures the romance and adventure of the iconic films with portraits of Jack Sparrow and his ally Will Turner. An expertly handcrafted and hand-painted miniature sculpture of the Black Pearl sails the high seas inside this sparkling glass globe. Further capturing the movie's swashbuckling aesthetic, the antiqued golden-finish base features the Kraken's tentacles as feet, Jack Sparrow's compass, details from the ship and more. For the perfect finishing touch, magical glitter swirls inside the globe as music from the movie plays. Strong demand is expected, so don't delay. Order now! Your ride is here, but you might want to think twice before shouting "shotgun!" because this spooktacularly chilling hearse is heading for its final destination. But put your fears aside! A mysterious dark angel has arrived just in time to help guide lost souls. Now, hitch a ride with her to the underworld in the Guardian Of The Underworld Sculpture, an art-filled first-ever by Jasmine Becket-Griffith, exclusively from The Hamilton Collection. This hearse sculpture comes fully loaded with marvelously macabre details that are to die for! This iconic 1930's style hearse sculpture is handsomely sculpted to full 1:18 scale, hand-painted with a glossy, midnight-black finish and features Jasmine's full-color artwork on both sides. Dreadfully delightful details from classic white-wall tires to a gleaming, chrome-like grille, headlights and ghoulish skull hood ornament add more delight. On top of the roof is the Guardian of the Underworld, a handcrafted angel sculpture demurely posed. Her brightly captivating wide eyes and colorful, two-toned stockings make her distinctly Jasmine while her skull in hand and majestic, black "feathered" wings spread wide, make it clear she's no stranger to the dark side. Strong demand is expected, so order now! March 20, 2016 was an epic NASCARÂ® race day pitting two superheroes of the track against each other and celebrating the movie premiere of "Batman v Superman: Dawn of Justiceâ„¢". Now, the Dale Earnhardt Jr. #88 Batman Racing Helmet captures all the excitement of the racing legend's tribute paint scheme in a must-have collectible available from Motorsport Editionsâ„¢. This FULL-SIZE Batman racing helmet is inspired by Dale Jr.'s sleek #88 ride from the intense showdown and features a fantasy-influenced design with dramatic hand-applied graphics. Your Dale Earnhardt Jr. #88 collectible helmet is stunningly realistic, from its replica air pump and radio input, to its safety head and neck restraint latches and realistic visors that really open and close and even feature tear-off buttons. Plus, the helmet is fully padded on the inside, with a special safety bar to distinguish it as a collectible tribute. Strong demand is anticipated for this Dale Earnhardt Jr. racing helmet and a Batman badge on the back of the helmet indicates your helmet's Issue Number. Hurry to race with Dale Jr. and Batman. Order now! Embrace the power of your dreams and ambitions just like these stunning Native American-inspired fairy maidens! Uniting the acclaimed fantasy artwork of Jasmine Becket-Griffith with the magnificent horse illustrations of Laurie Prindle, the Spirit Riders Figurine Collection is an enchanting first-ever available exclusively from The Hamilton Collection. Your limited-edition collection begins with Issue One, Dreamchaser. Soon your collection will continue with Issue Two, Freeheart, followed by Issue Three, Thunderspirit and additional Laurie Prindle and Jasmine Becket-Griffith figurines, each a separate issue, to follow. Each issue in this remarkable collection features one of Jasmine Becket-Griffith's wide-eyed fairies in a Native American-style outfit, posed atop a gorgeous horse inspired by Ms. Prindle's stunning artistry. Each edition is completely handcrafted by Master Artisans in artist's resin with sculptured gems, beadwork, feathers and more, then hand-painted with pearlescent and metallic hues, making these Native American-inspired figurines truly one-of-a-kind. Strong demand is expected, so don't delay. Order now! She stands before the tribe, proud and poised, lovely and serene, wearing a ceremonial headdress and gown hand-stitched for her by the elders. Today she is being revered as a spiritual leader among her people. To make this moment unforgettable, the maiden is given a sacred spirit staff and a necklace, both adorned with fiery and semiprecious gemstones. Now, you can display this symbol of spirituality with the Heart of a Great Spirit Sculpture, a first-of-its-kind limited edition exclusively from The Bradford Exchange. This hand-painted sculpture features a wealth of handcrafted details, making it a rare and special work of Native American-inspired art. It features deep sweeping contours and sharp angles that only individual handcrafting can offer, such as the amazing intricacies of the maiden's traditional dress. After it is hand-cast, artists painstakingly work to create a rich, multi-hued patina reminiscent of the finest bronzes. As a striking finishing touch, the sculpture is adorned with two genuine tiger's eye gemstones! Display this beautiful sculpture on your mantle or give it as a unique Native American-inspired fantasy gift to a special person. Strong demand is expected, so don't wait. Order now! As Ephesians 6:10-18 reminds us, our faith in God is a coat of armor that we wear everyday. Now you can be reminded of the Lord's strength with the Armor of God Sculpture, available only from The Bradford Exchange. This exquisite limited-edition cold-cast bronze sculpture features a powerful knight wearing the Armor of God and includes a removable two-sided Challenge Coin. Expertly hand-cast in cold-cast bronze and hand-painted with golden highlights, the knight stands ready for battle with his Helmet of Salvation, Breastplate of Righteousness, Belt of Truth, Shield of Faith, Sword of the Spirit, and Shoes of the Gospel. Showcased on the rugged, stone-look base, the Challenge Coin is real metal plated in 24K gold and enhanced with hand-applied enamel - a powerful symbol you can carry with you every day. This sculpture makes a bold religious gift for yourself or a loved one, but strong demand is expected, so hurry. Order now!